Customer satisfaction and product quality is at the heart of our business. To provide this goal, we are strongly appropriated to provide every customer with excellent support, so we get a differentation within the market. 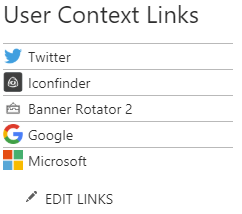 Serve informations into one place, bring up intuitive navigation or let your Employees build their own Quick Links, to simplify them working on its main core, instead of searching content. Branding output, set up custom Templates or define displayed content by the offered WebPart Properties. Having a question, do I miss a feature, dont hesitate to reach out our Support!